The AANA applauds Purdue Pharma for its steps to address the opioid epidemic in the United States by ending all promotion of its opioid, OxyContin, to prescribers. OxyContin is a semi-synthetic opioid made by modifying morphine, which is derived from opium. The active ingredient, oxycodone, is said to be twice as powerful and as addictive as heroin. In 2013, it was reported that 6.9 million people had used OxyContin non-medically in their lifetime. In 2016, Purdue products accounted for approximately two percent of the 11.7 billion opioids prescribed, equaling around 234 million pills. For more information on CRNAs’ approach to pain management, please visit the Pain Management. Ready to buy or refinance your home? Purchase of your dream home or save money with a refinance! Mortgage rates have been consistently low, making now a great time to explore your options. AANA Member Advantage Program Partner Quicken Loans' dedicated AANA Home Loan Experts are here to help you with all of your mortgage needs. Your friends and family members can also take advantage of these savings when they purchase or refinance! CRNAs who perform anesthesia for lower intestinal endoscopic procedures should be aware that the Medicare base units for the service differ from the base units reported in the 2018 American Society of Anesthesiologists (ASA) Relative Value Guide® (RVG). As the AANA reported back in November, CMS finalized its policy in the FY 2018 Physician Fee Schedule final rule to reduce the base units for CPT code 00812 (Anesthesia for lower intestinal endoscopic procedures, endoscope introduced distal to duodenum; screening colonoscopy) from 5 units to 3 units, despite AANA’s urging to not devalue this code. The ASA, which publishes the RVG used by industry and by anesthesia professions, also disputes CMS’s change and has chosen to reflect 4 base units in the 2018 RVG. The ASA RVG can differ from the Medicare base units. Despite this discrepancy, the Medicare agency and its Medicare Administrative Contractors (MACs) will only allow 3 base units in payment for this service. At this time, there is no indication that commercial payers are using the CMS base value of 3 for reimbursement. Therefore, CRNAs and their billers may choose to follow the ASA relative value system’s base value assignment in order to maintain a compliant charge structure. When claims are submitted to CMS, CRNAs’ reimbursement will reflect the 3 base units and should not result in an overpayment by Medicare. The AANA encourages CRNAs to alert the AANA of any issues from their MAC concerning this procedure and will continue to monitor this issue. Read the Physician Fee Schedule final rule, the AANA's comments on the proposed rule, and the Medicare allowable base units by CPT code for 2018. The US Food and Drug Administration (FDA) has announced the voluntary destruction and recall of a large volume of kratom-containing dietary supplements manufactured and distributed nationwide. The FDA continues to warn that compounds contained in kratom are opioids and are expected to have similar addictive effects as well as risks of abuse, overdose and, in some cases, death. Read more in FDA’s recent press release. Please take a few minutes of your time to complete a brief anonymous Practice Profile Survey. This is an anonymous survey and the data will not be analyzed or studied for individual responses. The results are reported in aggregate form only. The approximate time to complete this survey is 5-10 minutes. Please complete this survey by Monday, March 12, 2018. Please direct any questions to Luis Rivera at lrivera@aana.com, Senior Director, State Management Affairs. The draft practice document titled, The Collaborative Interdisciplinary Patient-Centered Care Team, is available for open comment through March 20, 2018. 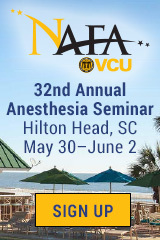 Please review and provide feedback to practice@aana.com. Download the draft document at Open Comment Opportunity. The AANA Foundation’s Student Advocate program was developed to create a connection, foster student engagement, and build a relationship between the AANA Foundation and students. The goal is to identify one Student Advocate in each nurse anesthesia program. Benefits include: increased knowledge of/connection to the AANA and AANA Foundation, networking, professional involvement, leadership, BOT mentors, Student Advocate ribbons at meetings, special invitations to various events, and free tickets to Foundation events to help out when needed. Visit the AANA Foundation’s Student Webpage to access the application or learn more. If your program does not have a Student Advocate, we encourage interested students to apply today! Questions? Contact Luanne Irvin at lirvin@aana.com or (847) 655-1173. The mission of the AANA Foundation is to advance the science of anesthesia through education and research. As the philanthropic arm of the AANA, the Foundation raises funds and invests in projects that directly support the nurse anesthesia profession. Spring Research Grant and Doctoral/Postdoctoral Fellowship applications are currently available on the AANA Foundation website. If you have any questions, please contact the AANA Foundation at (847) 655-1170 or foundation@aana.com. Your support is important! Please give today to the campaign to RISE Above. We ask every CRNA to join the movement to fund research to protect your practice and support the nurse anesthesia profession. Visit Rise Above to learn more and to make your commitment today! Supplementing cervical paravertebral block (CPVB) with stellate ganglion block (SGB) does not appear to increase analgesic effect during arthroscopic shoulder surgery, researchers report. Their randomized study included 10 adult patients who received CPVB plus SGB and 10 who received CPVB alone, with levobupivacaine as the anesthetic agent. Thermal quantitative sensory testing was conducted before local anesthetic infiltration and at several intervals during the ensuing 24 hours. The purpose of the testing was to identify thresholds for cold/heat pain and cold/warm sensations, and the researchers found no difference between the two groups for these neurosensitive/nociceptive modalities. Degree of motor block, time until administration of rescue analgesics, and visual analogue scale pain scores also were comparable from one set of patients to the other. Investigators, who published the findings in Pain Medicine, said that, based on the findings, it is "not unreasonable to suppose that pain from soft tissue injuries without bony lesions is transmitted mainly by somatic nerves with no or only minimal involvement of the sympathetic nervous system." They also noted that study participants who received both CPVB and SGB presented signs of Horner syndrome, a development that warrants further investigation. From "Examining the Additive Benefits of Stellate Ganglion Block for Shoulder Arthroscopy"
Researchers investigated whether parecoxib, which has been shown to deliver pain relief after total knee replacement (TKA) and other procedures, is more effective in one ethnic group than another. The study included 116 Korean adults, in whom moderate or severe pain persisted six hours after postoperative opioid analgesia ended. Participants were evenly and randomly allocated into two treatment arms: one receiving single-dose intravenous parecoxib and one receiving placebo. The primary outcomes were time-specific pain intensity difference, time-specific pain relief, and time to rescue medication — all of which were significantly better with parecoxib than with sham medication. Parecoxib also was associated with fewer adverse events. The findings were consistent with results from a similar investigation designed around Caucasian patients. From "A Randomized Study of the Efficacy and Safety of Parecoxib for the Treatment of Pain Following TKA in Korean Patients"
Journal of Pain Research (02/18) Vol. 11, P. 427 Essex, Margaret Noyes; Choi, Hee-Youn; Brown, Pritha Bhadra; et al. A review of the medical literature suggests that frailty is a predictor for postoperative delirium in older adults, according to a report in the Journal of General Interest Medicine. Researchers analyzed data from 41 published studies involving more than 9,300 elective surgery patients 60 years of age or older. Overall, almost 19 percent suffered confusion, paranoia, aggression, or other symptoms of delirium after their procedures; but the risk was approximately four times greater in participants considered frail. "Frailty is felt to reflect how well the body can withstand the impact of a major stressor," explained University of Toronto geriatrician and lead study author Jennifer Watt, MD. "It's then understandable that when the body of an older adult is confronted with a major stressor, such as surgery, it may struggle to both heal from the acute stressor and to continue managing all of the other medical illnesses. When the body can no longer manage all of the competing (conditions), patients may develop symptoms relating to these underlying medical illnesses such as delirium." Patients who developed postoperative delirium were more likely to face severe complications, prolonged hospitalization, discharge to a care facility rather than their own home, and death. From "Frail Elderly Face Increased Risk of Delirium After Surgery"
Ten hospitals took part in the Colorado Opioid Safety Collaborative, a six-month pilot project designed to cut narcotic analgesic use, with unexpectedly good results. The goal was for participating hospitals to reduce opioids by 15 percent; but Don Stader, MD, an emergency room (ER) physician who helped develop and lead the study, puts the average decline at 36%. "It's really a revolution in how we approach patients and approach pain, and I think it's a revolution in pain management that's going to help us end the opioid epidemic," he remarks. The decrease amounted to 35,000 fewer opioid doses than during the corresponding period of 2016. Adopting the alternative to opioids (ALTO) method used by Colorado ERs, the initiative called for coordination across providers, pharmacies, clinical staff, and administrators. Rather than opioids like oxycodone, hydrocodone, or fentanyl, doctors used safer and less addictive options including ketamine and lidocaine. The project has proven so successful that the ER departments involved will continue the new protocols and share their knowledge. Stader says the Colorado Hospital Association, which sponsored the pilot, will work toward statewide adoption by the end of this year. From "Ten ERs in Colorado Tried to Curtail Opioids and Did Better Than Expected"
A study conducted in Chile examined whether warming anesthesia has any influence on pain control during injection of dental anesthesia. Dozens of dental students volunteered for the research, which was carried out in two parts. In the first, each of the 72 participants received two injections of 0.9 mL of lidocaine HCl 2% with ephinephrine in the buccal vestibule at the level of the upper lateral incisor teeth. One week later, anesthesia was administered by randomized sequence on the contralateral side. Researchers compared the intensity of pain perceived during the injections, with the earlier set delivered at 107.6 degrees Fahrenheit and the subsequent set given at 69.8 degrees. Pain scores, measured on the visual analog scale, were significantly lower during the warmed anesthesia injections compared with the room-temperature injections. The investigators speculate that a synergic action on the permeabilization of the Transient Receptor Potential Vanilloid-1 nociceptor channels, facilitating the anesthetic's passage inside, might explain the relationship between warmed anesthetic and lower pain intensity. From "Effect of Warming Anesthetic on Pain Perception During Dental Injection"
Local and Regional Anesthesia (02/18) Vol. 11, P. 9 Aravena, Pedro Christian; Barrientos, Camila; Troncoso, Catalina; et al. A longitudinal study observed memory and executive function in middle-aged patients with no history of cognitive impairment before anesthesia and surgery. The sample population, taken from the Wisconsin Registry for Alzheimer's Prevention, included 964 participants with a mean age of 54 years at enrollment. Researchers measured participants for memory and executive function at baseline, at which time 212 of them had already had an operation within the previous five years. The same measurements were taken again four years later, at which time 130 more participants had undergone at least one surgery. Having a surgical procedure between the two assessments was associated with a one-point decline in immediate memory. Reduced immediate memory scores at followup also were significantly associated with the total number of operations in the preceding nine years for the 130 participants who had surgery after the initial evaluation. No additional disparities in other measures of memory and executive function were documented between patients who had and did not have surgery. Among those who did, declining executive function was tied to longer cumulative operations and physical status. According to the colleagues from the University of Wisconsin-Madison School of Medicine and Public Health and from Oregon Health and Science University, the findings offer additional insight into the risk for cognitive changes after surgery and anesthesia during the early years of aging. From "Cognitive Decline in the Middle-Aged After Surgery and Anesthesia"
Anaesthesia (02/21/18) Bratzke, L.C. ; Koscik, R. L.; Schenning, K.J. ; et al.